Awards Luncheon at the Metropolitan Club in New York December 3. 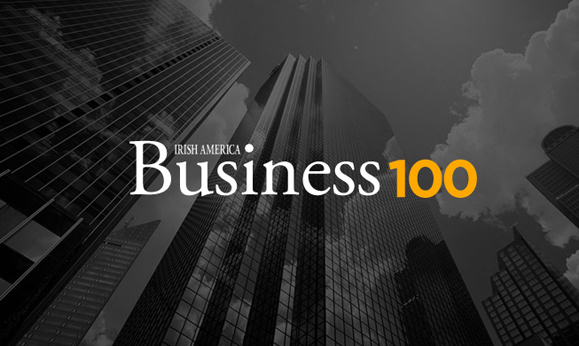 Irish America magazine announces its 30th annual Business 100 list in the December / January 2016 issue. This year’s honorees will be feted at the 2015 Irish America Business Awards Luncheon December 3 at the Metropolitan Club in Manhattan, co-hosted by ICON Plc. The event, which has come to be the premier networking event for Irish and Irish-American corporate leaders, will feature Jim Clerkin, president and CEO of Moët Hennessy North America, as its keynote speaker. Clerkin is the cover interview for the December / January issue of Irish America. The complete list of honorees can be viewed here. For 30 years, the list has recognized the phenomenal success of the Irish in corporate America, from executives and managers to partners and directors. The 100 honorees who comprise the 2015 list represent some of the most innovative and impactful organizations doing business in the United States. Ciaran Murray – CEO of ICON, Plc. “This year’s honorees represent one of the most geographically diverse group of entrepreneurs to be featured,” Irish America co-founder and editor Patricia Harty said. With over 30 years of experience in the beer, wine and spirits industry, Jim Clerkin began his career in Ireland, where he rose through the ranks at Guinness in a variety of roles to Executive Sales Director, becoming a member of the board of directors. He joined Moët Hennessy in 2008 to take on a new role as executive vice president and chief operating officer with responsibility for global brands such as Hennessy Cognac, Moët & Chandon Champagne, Dom Perignon, Veuve Clicquot Champagne, Grand Marnier and Belvedere vodka. As Keynote Speaker, Clerkin joins a distinguished group. In recent years Irish America has welcomed Shannon Deegan, Head of Global Security Operations at Google; Michael Dowling, president and CEO of Northwell Health Systems; Denis O’Brien, chairman of the board at Digicel; and William Ford, Jr., Executive Chairman at Ford. For more information on the 2015 Irish America Business 100 Awards luncheon, which will recognize their contributions to innovative business practices and the shared fact of their Irish heritage, click here.